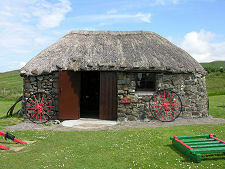 The Skye Museum of Island Life stands on a hillside close to the tip of Skye's Trotternish Peninsula. This gives it superb views across the Minch to the Western Isles. But it also gives it one of the more remote locations on Skye, six miles of single track road north of Uig, and 18 miles north of Portree. 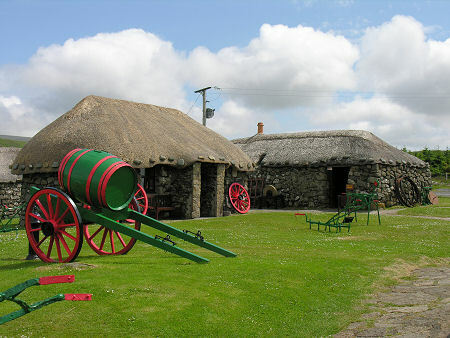 But no visit to Skye can be considered complete without a tour of Trotternish, and no tour of Trotternish can be considered complete without spending some time at northern Skye's best visitor attraction: The Skye Museum of Island Life. 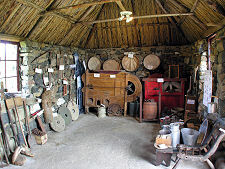 The Museum gives an insight into a way of life that was common on Skye and across the highlands and islands more widely at the close of the 1800s: but which has since virtually disappeared. 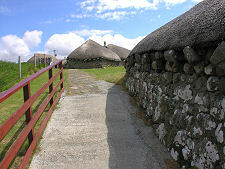 It consists of a group, or township, of seven thatched cottages, four of which are furnished and equipped as they would have been at the time to illustrate different aspects of island life. On entering the township from the good-sized car park, you are directed to the central cottage, home to the reception and gift shop. This stocks, amongst other things, an excellent selection of books about Skye, its people and its history. 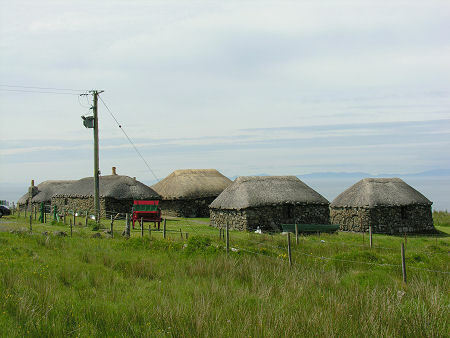 The cottages with recreated interiors are the four most closely clustered around the central cottage. We'll come to those in a moment, after taking a look at the two other cottages. These lie towards the far, lower, end of the township and comprise The Ceilidh House and The Byre. The Ceilidh House is home to a superb collection of historical material about Skye including large numbers of old postcards and documents. 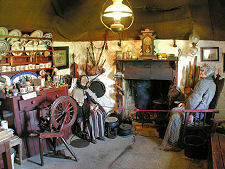 The Byre serves as a more general museum, housing a range of items that though fascinating in themselves, clearly did not fit with the themes of the individual cottages elsewhere in the museum. 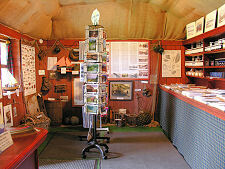 In many ways the heart of the museum lies in The Old Crofthouse, the largest of the seven cottages on site. This is divided into three rooms. The most important is the kitchen, which served as the main living area of the cottage. Here the family would gather around a peat fire that was lit 24 hours a day and 365 days a year. 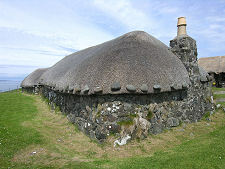 With a fireplace and a chimney, the fire offered warmth without the all-pervading smokiness and "peat-reek" of an earlier generation of croft houses built with a central hearth. 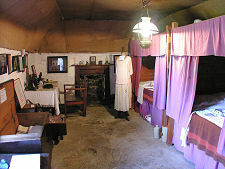 The children's bedroom is the largest room in the Croft House, and contains two well-insulated box-beds, while another is found in the parents' bedroom, off the kitchen. All the rooms are furnished with a full range of "family possessions". 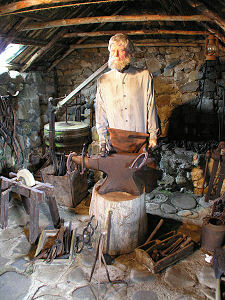 The Old Smithy comes complete with the figure of the smith, shaping horseshoes on his anvil, and is fully kitted out with the fixtures and fittings, the tools, and some of the products the smith would have made. You can't help wondering in passing how compatible the smith's open hearth and the sparks generated by his metalworking would have been with the thatched roof! The Weaver's House contains an impressive collection of items relating to one of the most important industries on the island, the weaving of locally grown and gathered wool. 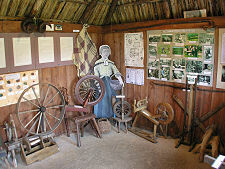 Amongst the exhibits is a complete weaving loom, which fills one end of the cottage. Next door is the final thatched cottage, The Old Barn, home to a truly spectacular collection of agricultural tools and equipment. Speaking of which, the grassy areas between and around the cottages are used to display a range of larger items, mostly agricultural in nature. These are possibly better looked after than they would have been when in use, and all come in matching green and red paint: the overall effect ties the different elements of the museum together very nicely without any of the shabbiness that would inevitably have come from leaving these items in their natural state. 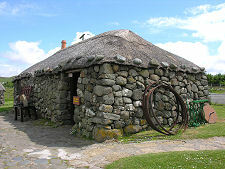 The Skye Museum of Island Life opened in 1965, making use of a thatched cottage (now The Old Croft House) that had been built at the beginning of the 1800s and which had been in use as a family home until 1957. The museum has evolved and grown throughout the last four decades, and continues to do so today. The aim is to enlarge the township further to the point where every aspect of life at the end of the 1800s is recreated. It is also hoped to turn it into a living museum, where the way of life and everyday skills can be seen actually taking place. 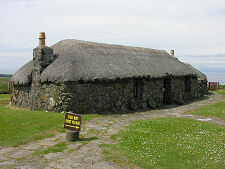 And it is worth remembering that The Skye Museum of Island Life does not exist in isolation. Having made your way to this end of Trotternish, remember that Kilmuir Graveyard, home to some fascinating gravestones including that for Flora MacDonald, is close by, as are the ruin of Duntulm Castle and the Kilvaxter Souterrain. Kilmuir, Isle of Skye IV51 9UE.